Art really can turn a frown upside down. 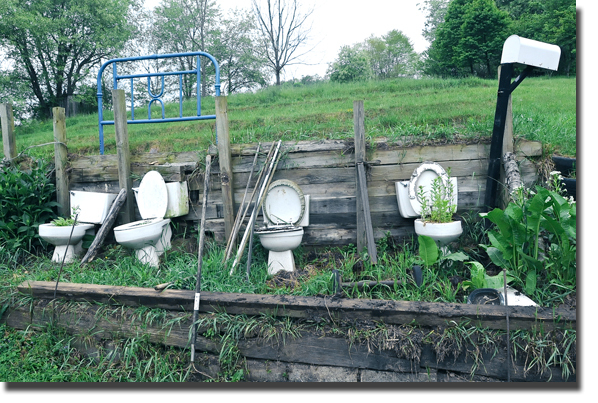 I was checkin' out the scenery on the Georges Gap Rd and passed by a display of toilets I've wondered about for years. See, if you twist your head just right, you'll catch a glimpse of what appears to be a row of toilets peeping over the yard's horizon. But to date there was never any context to make sense of the partial view. Still, even finally piecing together the puzzle doesn't necessary make the scene completely rational, so we'll categorize this yard as art. How did I finally capture these images? Previously I was too timid to stop and ask permission to take photos because a person who collects toilets in their yard, well, their personality is difficult to predict. But today was the day to solve this mystery. I reckon I was channeling my inner Nancy Drew. I pulled into the driveway and knocked on the door. No answer. So I took it upon my nosy self to walk around to the side and get a good look-see. 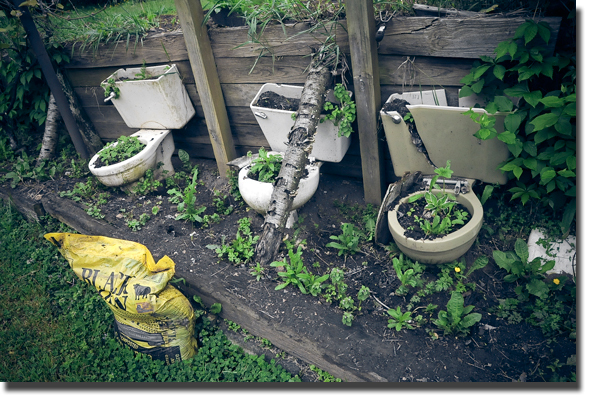 The owner uses the toilets as brilliant little utilitarian planters. And they please me, too. I especially like the bag of manure in the foreground which is used to fill the toilets with the necessary brown gold. Some folks may see toilet art as tacky and weird, but I see it as quirky, fun and now I can't wait to meet the artist.